My dad and brother planned a trip to the property, and I joined them this last weekend. My mom and sister came, too. One of my nieces was ill, so my sister-in-law stayed home with them, and we missed them very much. My boyfriend was away for work, and I missed him terribly! When I got to the property, my dad and brother were already there. They warned me to leave the dogs in the truck due to the unforeseen presence of some wildlife. I heard a soft chittering sound– almost like a cry, but I didn’t see anything. I immediately asked if there were moose around– my property is marked by several moose trails. It’s the wrong time of year for them, but stranger things have happened. Reindeer sausage thanks to Alaska Sausage and Seafood! So delicious! If you haven’t had a reindeer sausage from Alaska Sausage & Seafood, you need to experience this as soon as possible. I’m not affiliated with them in any way, but they get a link because you MUST try their reindeer sausage! They’ll ship it to you! So if my mysterious wildlife wasn’t a reindeer or a moose… then what could it have been? A goat! A friendly goat who just wanted to be petted and who had quite obviously chewed through his leash. 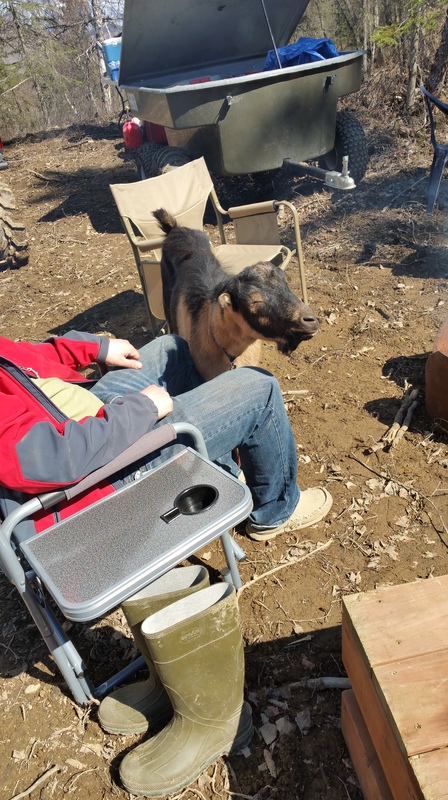 The goat tried to jump up into my brother’s lap. 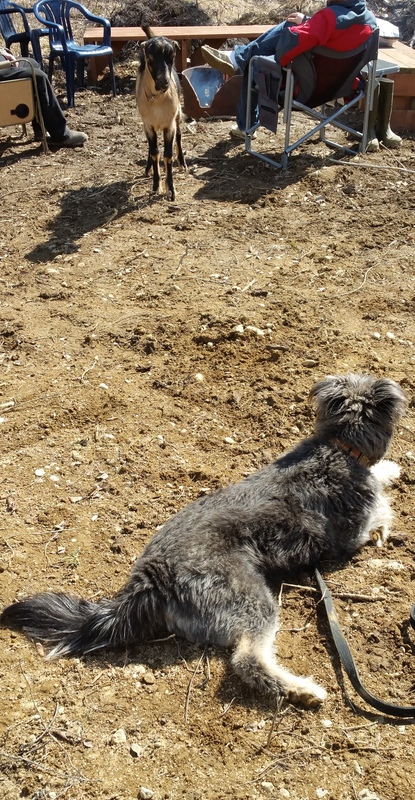 I introduced Kita to the goat first, but she went nuts barking and lunging at the goat. Then, I put Kita in her kennel and tried introducing Kowe to the goat. As you can see, Kowe was really, really bothered by the presence of the goat. Kowe mulls over the camp life while the goat checks her out. After an hour or so, when we knew the nieces would not be joining us, the novelty of the goat wore off, and I took it for a long walk around the block to find his home. A goat with a collar and frayed leash obviously belongs to someone, right? Well, come to find out, he belonged to my neighbor across the street, but we didn’t find that out until we had given up on finding him a place to be. Before night fell, the goat was gone, and Kita finally got to be free. 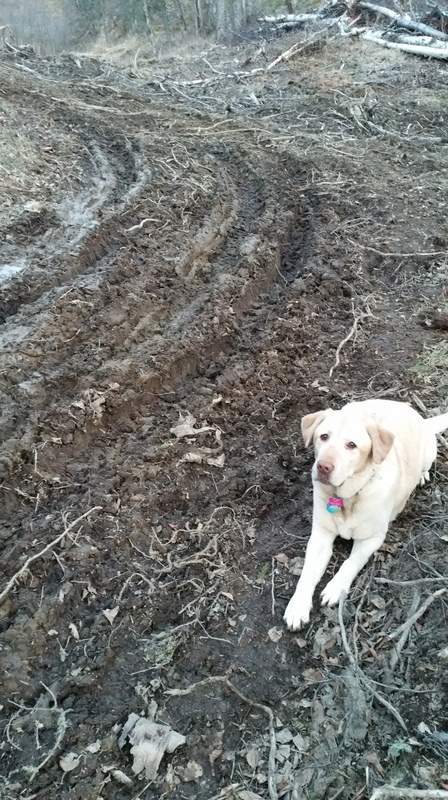 The goat walked through the mud and ruined Kita’s perfect mud bath. She did not like the goat at all! See all that mud? Those big ruts are from just a few trips up and down the hill in the side-by-side. 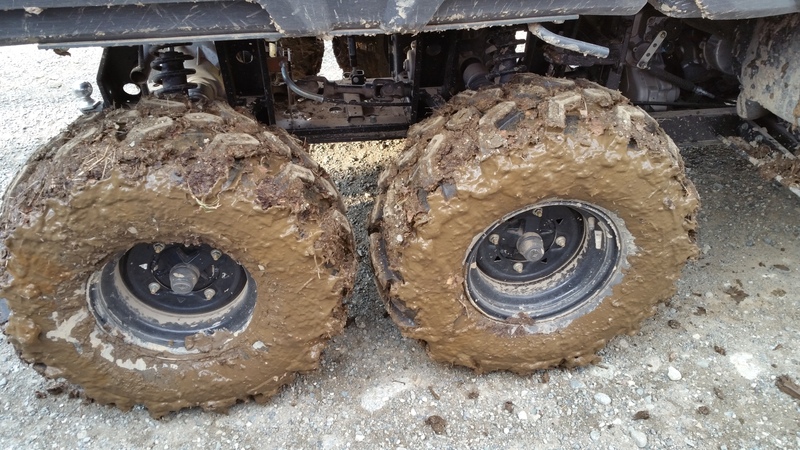 By the time the weekend was over, the ruts were bigger, deeper, and wetter. So much mud! We’re going to have to muck it all out in the next couple of weeks! There are lots of giant roots balls and trees that are just kind of laying around the property from our dozer work last year. I’ve rented equipment to take care of some of that this month. My dad’s going to help, but my brother and boyfriend probably won’t be able to join us. The excavator isn’t too expensive to rent, so even if all we do is get some trees piled up nice and neat, I’ll be happy. I’d like to make use of the trees for firewood or building materials, but there are just so many of them. I feel like I have a summer’s worth of work just getting them into rounds. I could spend a lifetime of winters trying to get them all chopped for firewood. 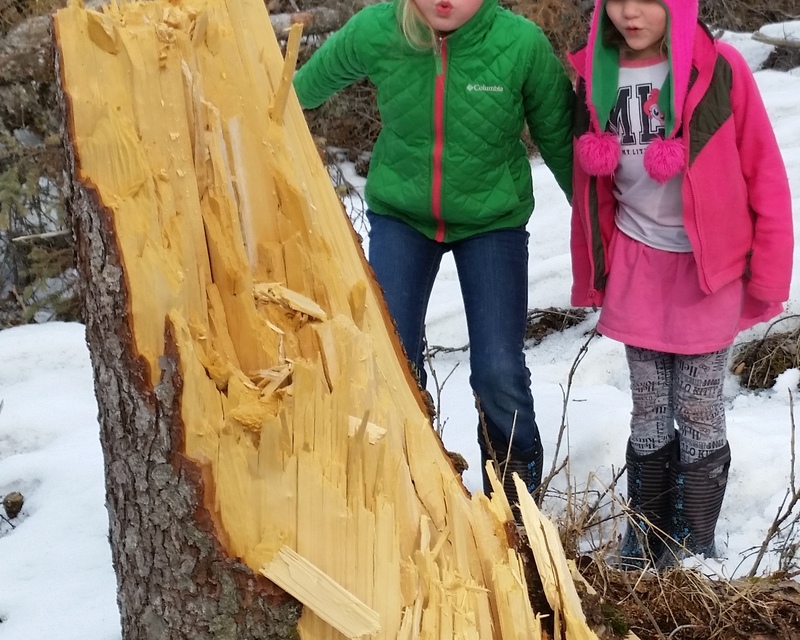 When we visited a few weeks ago, we found a giant spruce that hadn’t been able to survive our winter storms or my nieces’ impressions of the Big Bad Wolf. I was really bummed that they couldn’t make it this weekend. I’ll Huff and I’ll Puff! So even without all the work we did last year, there was still a lot of work just because of the winter conditions this year. We couldn’t have had better weather this weekend. The nights were chilly, but the days were warm enough for tank tops and tans! As a welcome finisher from our dinner, we enjoyed the summer’s first s’mores with amazing square marshmallows. It really sets the golden standard for the ratio of marshmallow to chocolate. Plus, the shape of the marshmallow gives you more surface area with the golden toasted texture, and since the marshmallow isn’t too thick, it gets completely gooey inside. Literally, perfect! 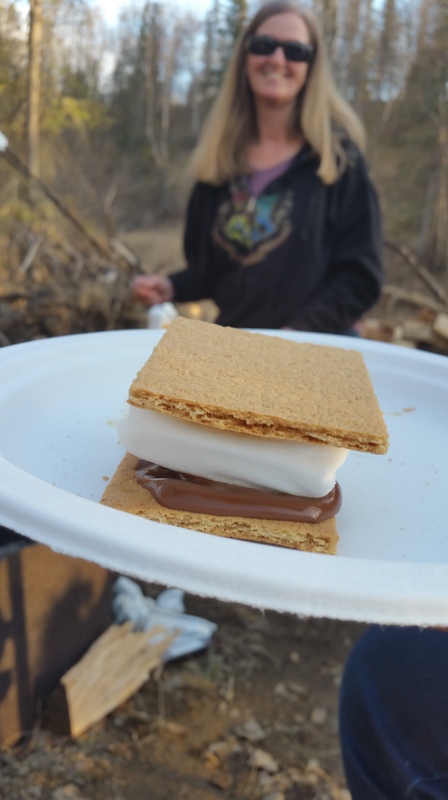 The year’s first s’mores! The square marshmallows were perfect! No more round ones for this family! I ate two of these bad boys! That is just how perfect those square s’more shaped marshmallows are! Irresistable! I spent the first night in the arctic oven. Just me and the puppies. The whole point of us getting a tent with a vestibule was so that the dog kennels could go inside the vestibule, but I didn’t want Kowe’s whining to wake everyone up. Both dogs were happy and comfy inside the tent with me. Just goes to show how spoiled they are! I used a little Mister Buddy heater inside the tent for about 10 minutes before I went to bed. It wasn’t really cold inside the tent, but I felt like I should. Then, it was too hot to even climb into my sleeping bag, so I turned the heater off. It got cold enough to freeze the mud puddles solid and the dog bowl had a thick layer of ice over the top. I made it though the whole night without turning the heater on. I have a good sleeping bag, but I was never that warm in the Kodiak canvas. It was an excellent trial-camping weekend. My dad and I have a solid plan for what to do next in the long, slow journey to cabinhood, and I can’t wait for all the camping adventures this summer! What are your summer camping plans like? Would you even consider tent camping if it was going to be well below freezing at night? 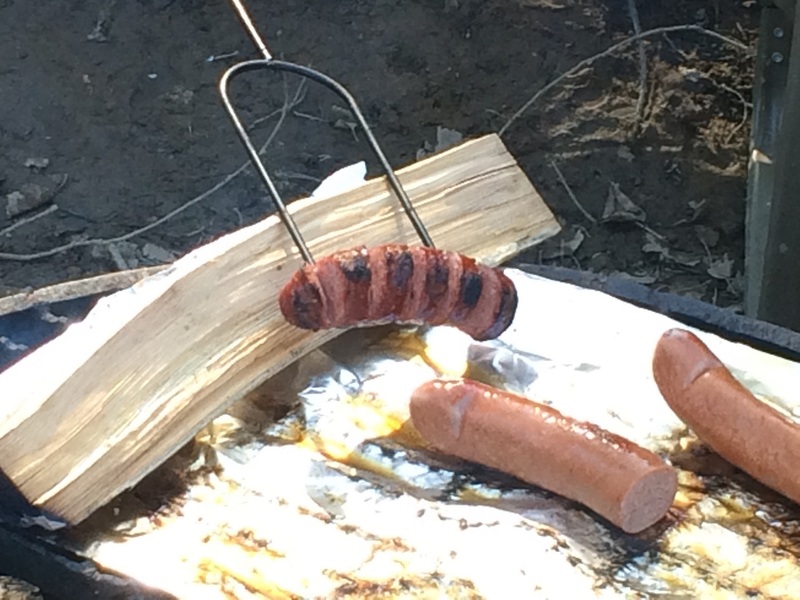 Please note that I am unaffiliated with JetPuffed S’more Shaped Marshmallows, Alaska Tent & Tarp (the maker of the arctic oven), or Alaska Sausage & Seafood. I just felt really strongly that these things were excellent this weekend! This entry was posted in All, Cabin and tagged alaska, alaska sausage & seafood, alaska tent and tarp, arctic oven, arctic oven with vestibule, cabin building, camping, cook out, goats, grilling, Jet Puffed, moose, reindeer, reindeer dogs, s'more shaped marshmallows, s'mores. Bookmark the permalink.